Professor Michael Stockenhuber has long held a fascination for catalytic reactions and their almost unlimited scope when it comes to solutions for industry and the community. Joining UON in January 2008, Professor Stockenhuber has honed his focus on catalysts because of its practical application in enabling technologies. “Catalysis research has, at least in my opinion, a big advantage in that it can be rather fundamental in its nature, but it is also very applied. As a result, there is a significant commercial interest in this technology. The largest tonnage amount of chemicals produced is done through catalysis." The key to catalytic conversion’s success is that catalysts increase the speed of any reaction - this is crucial - otherwise the process would be far too slow and wouldn’t be viable economically or environmentally. Many environmentally-friendly technologies such as biofuels, have a significant oxygen content in the fuel, which is problematic for use in standard engines. However, we can remove the oxygen from the fuels using catalytic technology. This makes a fuel that originates from a biological source, such as wood or biowaste, waste oils or even molasses, more usable and a viable alternative. In fuel production it is vital that every part of the process is utilised: you need to find a solution for the by-products and make them value-added products. Glycerol is a by-product of biodiesel manufacturing, so researchers are trying to make it economically useful by creating a product from it. Using catalytic technology plastics can be manufactured using glycerol – making a useful product from a by-product. End of pipe technology is the process of cleaning up waste products at the end stage of production. The catalytic converter for cars is a typical end-of-pipe product which converts harmful nitrogen oxide into nitrogen and oxygen. With the rise in diesel cars or lean-burn engines, we don’t have a very efficient catalytic converter to convert the emissions safely. Michael and his team are working on developing an efficient product can reduce airborne pollution and emissions in these increasingly popular vehicles. “Another area we’re very interested in is the catalytic conversion of methane. This end-of-pipe technology is used in coal mines which have significant methane emissions. Methane is a very effective greenhouse gas, so we are trying to convert the methane to CO2 to reduce the methane levels,” Michael says. As a member of the International Advisory Board for the International Conference on Environmental Catalysis Michael made the proposal to bring the International conference to Australia. With the aim of starting an invigoration of the Australian catalysis scene, the conference was held in Newcastle from July 10 2016. “The scope with catalysis is almost unlimited, there are virtually no conversions that cannot be undertaken with catalysis. With environmental considerations the field has become invigorated again as it is being seen as one of the major enabling technologies for specificity of production of products. One of the big advantages is that you can scale up very nicely, you can transform the technology from the laboratory to industry very easily. We have the technology to transform a fossil fuel or biological fuels into a more renewable-based future. It’s exciting technology with enormous economies of scale potential." Catalysis is one of the main enabling technologies that will be able to implement new commercially viable and environmentally friendly processes for manufacturing and emission control. The possibilities to manufacture future energy carriers, materials, chemicals, pharmaceuticals and to reduce emissions are endless. Professor Michael Stockenhuber has long held a fascination for catalytic reactions and their scope when it comes to solutions for industry and community. Prof Stockenhuber has published more than 90 peer reviewed papers and holds 4 patents. He has a H index of 17 and has been cited more than 1100 times. He has been hon. secretary of the British Zeolite Association and has been secretary and is now president of the Australian Catalysis Society. 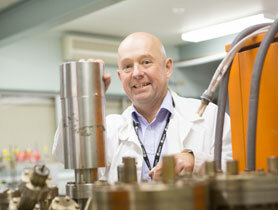 He has established and is head of the catalysis and process research laboratory at the University of Newcastle. From 2013 to 2016 he has been Assistant Dean, Research Training in the Faculty of Engineering and Built Environment. Michael Stockenhuber was awarded his diploma (Dipl.Ing.) in “Chemical Technology” in 1990 at the Technical University of Vienna. He continued his studies for a PhD at the Institute of Physical Chemistry (Prof. Johannes Lercher) which he was awarded with distinction in 1994 (Dr.Techn.) He then did a brief study postdoc at the University of Twente. He joined Nottingham Trent University in 1995 as postdoctoral researcher and was later appointed lecturer (1998) and promoted to Reader in 2007. In 2008 he was appointed senior lecturer in Chemical Engineering at University of Newcastle. In 2012 he was promoted to Associate Professor. His main research interest is heterogeneous catalysis and nanoporous materials with a special emphasis on structure- function relationships. Current topics of interest include mineral carbonation, catalytic combustion of ventilation air methane, conversion of glycerol to useful products, acid site characterisation using i.r. and X-ray absorption spectroscopy, dehydrogenation of hydrocarbons, zeolites as base catalysts, selective hydrocarbon oxidation and fine chemical synthesis using “green” solid catalysts. Prof Stockenhuber received funding from highly prestigious projects with BP, EADS (Airbus), BHP, AEL and setup collaborations with a number of research groups all over the world. That is evident not only through the high impact of his papers but also the number of institutions seeking collaboration with him. In Australia he received more than $4.2 million AUD research funding from ARC, other Australian funding bodies, and industry. The funding was for fundamental (such as the work on local site structure in zeolites) as well as applied studies, such as mineral carbonation, the development of a catalytic system to produce hydrogen on board an aircraft (EADS) and catalytic combustion of ventilation air methane and conversion of high value products from glycerol as well as methane conversion to value added products. © 2018 Elsevier Ltd Vast reserves of peridotite and serpentinite rocks can be utilised for the safe and permanent sequestration of global CO2 emissions via aqueous mineral carbonation. These, and indeed most feedstocks used in mineral carbonation require ultrafine grinding and/or heat-activation, to engender significantly enhanced reactivity in the rock such that it can then be carbonated. Both activation processes are energy intensive and present significant obstacles to the commercial application of mineral carbonation. Here we show that these limitations can be addressed, at least in part, through the application of a concurrent or in operando grinding technique which does not require feedstocks which have been subjected to prior ultrafine grinding nor heat-activation. Concurrent grinding is shown to result in a significant increase in magnesite yields for non-heat activated feedstock, prepared such that fines (<20 µm particles) were excluded from the feed. We assert that concurrent grinding may be a suitable technique for the processing of feedstocks such as those containing significant proportions of forsterite and pyroxene, minerals which are unresponsive to thermal activation for use in aqueous mineral carbonation. This study also investigates the effect of different grinding media particle size on reducing the particle size distribution (PSD) of the feed. Optimum ratio of grinding media size to feed particle size, optimum grinding media and slurry concentrations, optimum time for grinding and optimum impeller designs are determined for the system under study. The quantitative effect of grinding media concentration, slurry concentration, pressure and temperature on magnesite yield has been investigated. © The Royal Society of Chemistry 2019. An increase in biodiesel production has seen a dramatic increase in the production of glycerol, the main by-product. To maintain biodiesel production as economically viable, processes for valorising the 10 wt% glycerol waste stream need to be developed. The content of this chapter discusses recent work which examines potential catalytic processes for producing value added chemicals using glycerol as a platform chemical. Significant research has focussed on catalytic reactions tailored to selectively convert oxygenates from biological resources to produce valuable chemicals. While homogenous and biological catalytic processes are important, heterogeneously catalysed reactions are considered to be more desirable and potentially more economically viable due to advantages in feedstock processing. The current transesterification process associated with biodiesel production results in a number of contaminants in the glycerol stream, such as free fatty acids and residual catalyst salts, which affects downstream processing. Special emphasis is given to understand how contaminants of various by-products interact with surfaces and identify robust catalysts while examining alternative catalytic processes for producing biodiesel with purer product streams. Copyright © 2018 American Chemical Society. We present a model to describe carbon dioxide (CO 2 ) capture using reactive silicate-based mineral slurries exposed to a gas flow containing CO 2 . The model is validated through experimentation using thermally conditioned or heat-activated serpentinite (hydrous metamorphic ultramafic rock) in a laboratory-scale bubble column reactor. The kinetic model developed advocates a holistic modeling approach, offering an expanded view of the dissolution of heat-activated serpentinite under lean CO 2 conditions, in which the gas-liquid-solid system and its influence on CO 2 dissolution and the coupled dissolution behavior of the material are considered in their entirety. Modeling incorporates the characteristics of the gas to liquid phase interaction, such as CO 2 composition of the gas phase and interfacial area, the composition of the aqueous phase and its temperature, and compositional and morphological features of the solid. We demonstrate that such an approach is essential when considering proton-limiting conditions that are especially relevant to mineral dissolution under dilute CO 2 conditions in short reaction timeframes. The model is of particular relevance to the use of reactive silicate-based minerals for the aqueous capture of CO 2 from dilute CO 2 gas streams. The model as developed can be used to predict CO 2 capture using heat-activated serpentinite slurries for a given set of operating conditions and should be adaptable for use with other alkaline materials of defined reactivity in similar or varying reaction settings by adequately specifying reaction conditions. © 2019 This work discloses a possible explanation for the relatively low efficiency and yield observed in direct aqueous carbonation of heat activated serpentine which remained a critical unanswered question during three decades of ex-situ mineral carbonation research and development. The discovery of undesirable side reactions, occurring during direct aqueous carbonation of heat activated serpentine has been reported and investigated in detail. These reactions result in the reformation of crystalline serpentine and precipitation of amorphous magnesium silicate hydroxide phase/s on the surface of reacting feed particles. Reformation of serpentine occurs under relatively mild conditions (in terms of pressure and temperature) and after only a few minutes of reaction which is in stark contrast to the conditions and rates which occur during geological serpentinisation and other laboratory studies. Scanning Electron Microscopy and Energy Dispersive X-ray spectroscopy analyses showed precipitation of amorphous magnesium silicate hydroxide phase/s during carbonation process. Fourier Transform Infrared Spectroscopy and Thermogravimetric analyses identified and quantified free and hydrogen bonded hydroxyls of silanol groups in the structure of the reaction products when heat activated lizardite and antigorite were carbonated. The growth of a crystalline serpentine phase was confirmed and quantified by X-ray Diffraction and Thermogravimetric analyses in the reaction products when heat activated antigorite was used a feed. © 2018 American Institute of Chemical Engineers This research explores the use of serpentinized dunite (which is comprised of 61% lizardite) as a feedstock for aqueous mineral carbonation. In initial experiments, dunite was heat-activated (630°C, 4 h), adopting a procedure which is similar to that used for serpentinite to enhance their carbonation reactivity. Heat-activation converts crystalline lizardite mineral into an amorphous, reactive phase, and the carbonation of this heat-activated material resulted in a magnesite yield of 55% compared to 27% obtained with raw dunite under the same reaction conditions. The formation of silanol nests occurred during carbonation of heat-activated dunite as deduced through FTIR and TGA-MS analyses. Samples of dunite were also heat-transformed at high temperatures (800°C, 3 h) to convert lizardite into forsterite, and these samples were also studied as potential feedstocks for mineral carbonation. Heat-activated dunite was found to engender much higher magnesite yields compared to heat-transformed dunite (forsterite rich) and raw dunite. This study suggests that during heat-activation of dunite, as it is for lizardite, conditions should be maintained to avoid forsterite formation. © 2018 American Institute of Chemical Engineers Environ Prog, 2018. © 2018 American Institute of Chemical Engineers In this experimental work we synthesized, characterized, and investigated the reactivity of silica-enriched residue materials produced from low pressure, low temperature dissolution applicable to a two stage mineral carbonation process. XRF and XRD analysis indicated that 66 wt % of silica-enriched residue (SER) produced from dissolution of heat activated lizardite comprised amorphous silica. We also treated SER with nitric acid to produce amorphous acid treated silica-enriched residue (ATSER) with over 88 wt % silica. Dissolving these synthesized materials in highly alkaline solution with pH similar to cement paste pore solution for 28 days showed that all synthesized materials displayed some level of Si solubility. ATSER showed the most rapid rate of Si extraction, higher than silica fume (a commercial pozzolanic cement substitute), followed by silica-enriched residue (SER) which had a faster rate of Si extraction compared with Portland cement as a standard. © 2018 American Institute of Chemical Engineers Environ Prog, 2018. © 2017 Elsevier B.V. The rate-determining step in the aqueous carbonation of serpentine minerals is the dissolution of Mg from serpentine. The dissolution rate of minerals largely depends on the pH of the solution and the size of serpentine particles. In the present work, an experimental method has been developed to study the dissolution rate of heat activated serpentine (lizardite polymorph) in a wide range of pH, solid to liquid ratio and particle size at room temperature. The results allowed us to determine the effect of these variables on the dissolution kinetics of heat activated lizardite, which represents crucial kinetic data for accurately modelling the carbonation rates of serpentinite. Additionally, amorphous Si re-precipitation at high solid to liquid (S/L) ratio and pH 6.1 was demonstrated. These provide essential data for the design and optimisation of industrial mineral carbonation processes. For the first time, the crackling core model (CCM) was applied to model the dissolution kinetics of heat activated lizardite in acidic solutions. Applying the CCM model to a wide range of particle sizes provides useful information on the mechanism of the dissolution of heat activated lizardite and the range of particle size for which the assumptions of the model are valid. Characterising serpentine particles leached under different conditions, along with analysing model parameters, provided a new insight into the mechanism of the dissolution of heat activated lizardite. © 2016 Elsevier B.V. This paper presents the results of dichloromethane (DCM) decomposition to polymers utilising dielectric barrier discharge under non-oxidative reaction conditions. The conversion levels, mass balance, reaction mechanism and polymer characterisation in relation to DCM reaction are presented in this paper. Reaction pathways describing the decomposition of DCM and subsequent formation of the major products are outlined. Speculation of the mechanism of formation of CHCl3 and C2HCl3 are supported by quantum chemical calculations. In addition, the effect of introducing methane in the reaction feed on the conversion level of DCM and the polymer structure is also examined in this paper. © the Owner Societies 2016. A novel Pd supported on TS-1 combustion catalyst was synthesized and tested in methane combustion under very lean and under highly humid conditions (<1%). A notable increase in hydrothermal stability was observed over 1900 h time-on-stream experiments, where an almost constant, steady state activity obtaining 90% methane conversion was achieved below 500 °C. Surface oxygen mobility and coverage plays a major role in the activity and stability of the lean methane combustion in the presence of large excess of water vapour. We identified water adsorption and in turn the hydrophobicity of the catalyst support as the major factor influencing the long term stability of combustion catalysts. While Pd/Al2O3 catalyst shows a higher turn-over frequency than that of Pd/TS-1 catalyst, the situation reversed after ca. 1900 h on stream. Two linear regions, with different activation energies in the Arrhenius plot for the equilibrium Pd/TS-1 catalyst, were observed. The conclusions were supported by catalyst characterization using H2-chemisorption, TPD, XPS analyses as well as N2-adsorption-desorption, XRD, SEM, TEM. The hydrophobicity and competitive adsorption of water with oxygen is suggested to influence oxygen surface coverage and in turn the apparent activation energy for the oxidation reaction. © 2016 Elsevier B.V. In this contribution, the development of a process for the synthesis of potentially highly valuable polymeric products from the reaction of waste glycerol with ammonia is reported for the first time. The polymers were the result of a single step, continuous gas phase process, catalysed by an alumina-supported iron catalyst, operating under relatively mild reaction conditions. The solid product was characterised using 1D and 2D NMR spectroscopy, FTIR spectroscopy, qualitative chemical tests and elemental analysis. Characterisation revealed building blocks with unsaturated, amido and ester functionalities shaping a mixture of polymers. Nitrogen atoms were present in the main chain of the resultant polymers. NMR analyses of the polymer denotes the formation of structural defects such as unsaturation and branching; whilst the partial solubility of the polymer in solvents such as CDCl3 and THF is indicative of the formation of cross-linked structures. Insights into the mechanism of formation of these functional groups were based on the liquid and gas phase product distribution. Polymers with chain structures similar to those synthesised in this work are currently manufactured from fossil fuels and are widely used in biomedical applications not only because of their architecture but also due to their response to changes in pH and temperature. © 2015 The Institution of Chemical Engineers. 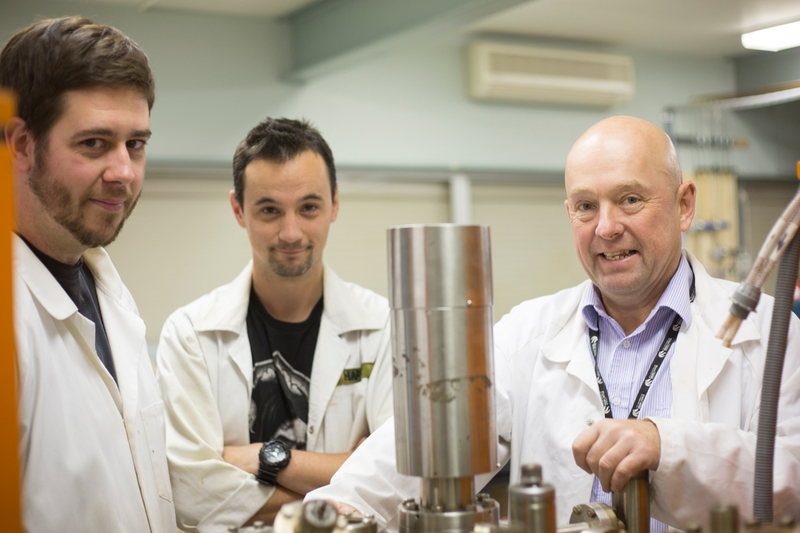 An increased interest in using hydrocarbons in solid oxide fuel cells for the production of power has led to research into operation on synthesis (syn) gas, a mixture of hydrogen and carbon monoxide. Hydrocarbons are typically reformed, either internally or in an external reformer prior to the fuel cell, producing syngas with various H<inf>2</inf>:CO ratios depending on the hydrocarbon used. This paper examines the effect of varying the H<inf>2</inf>:CO ratio with respect to C<inf>1</inf> to C<inf>4</inf> steam reforming reactions and additionally a mixture containing a higher ratio of carbon monoxide. It was found that there was no significant relationship between cell performance and H<inf>2</inf>:CO ratio when a high feed rate was employed. For low flow rates, however, the high carbon monoxide concentration resulted in a significant decrease in cell performance. It was determined that this was caused by reversible carbon deposition as opposed to a decrease in carbon monoxide reactivity. © 2014 Elsevier B.V. All rights reserved. Nano-sized Co3O4, Fe2O3, Au/Co3O4 and Au/Fe2O3 catalysts were prepared and evaluated for catalytic combustion of lean methane-air mixtures. Characteristics and catalytic activities under dry and wet feed conditions were investigated at gas hourly space velocities up to 100 000 h-1 mimicking the typical flow and conversion requirements of a catalytic system designed to treat a ventilation air methane stream. In order to gain a better understanding of the interaction between H2O and the catalyst surface, temperature-programmed desorption of water over fresh and used samples were studied, and supported by other catalyst characterization techniques such as N2-adsorption desorption, XRD, TEM, SEM and XPS analyses. The activity measurements of the catalysts studied identify Co3O4 as the most active material. Co-precipitating gold particles with cobalt oxide or iron oxide do not enhance the activity of the catalyst, which is most likely due to blocking the active site of support by the gold particle. The presence of strong hydroxyl bonds on the catalyst surface is substantiated by TPD and XPS analyses, and is suggested to be responsible for the rapid deactivation of Fe2O3 and Au/Fe2O3 catalysts. © 2014 Elsevier B.V. All rights reserved. Reagents from a base catalysed condensation reaction (Knoevenagel condensation reaction between ethyl cyanoacetate and benzaldehyde), were adsorbed on ZnO and Al < inf > 2 < /inf > O < inf > 3 < /inf > catalyst surfaces and subject to temperature programmed desorption experiments, monitored using mass spectrometry. Ethyl formate, ketenimine species, carbon dioxide and carbon monoxide were desorption products from ethyl cyanoacetate, while benzene, carbon dioxide and carbon monoxide were desorbed from the catalysts loaded with benzaldehyde. The formation of the ketenimine species was confirmed by in situ FTIR experiments. The observation of the decomposition species further substantiates a proposed reaction mechanism for the Knoevenagel condensation reaction on the catalyst surface of some oxide catalysts. Reaction of phenol with hydrogen peroxide over H-MFI, Fe-MFI, H-BEA, Fe-BEA and TS-1 zeolite catalysts was investigated. Over H-BEA, biphenyl product was observed. It is suggested, that the larger pore size of H-BEA facilitates coupling of two phenol molecules. Two distinct reaction mechanisms are proposed for acid and redox catalysts. © 2013 Springer Science+Business Media New York. In this paper we focus on the development of a methodology for treatment of carbon tetrachloride utilising a non-equilibrium plasma operating at atmospheric pressure, which is not singularly aimed at destroying carbon tetrachloride but rather at converting it to a non-hazardous, potentially valuable commodity. This method encompasses the reaction of carbon tetrachloride and methane, with argon as a carrier gas, in a quartz dielectric barrier discharge reactor. The reaction is performed under non-oxidative conditions. Possible pathways for formation of major products based on experimental results and supported by quantum chemical calculations are outlined in the paper. We elucidate important parameters such as carbon tetrachloride conversion, product distribution, mass balance and characterise the chlorinated polymer formed in the process. © 2014 Elsevier B.V. Conversion of glycerol to allyl alcohol was carried out over an iron on alumina catalyst. With the aim of enhancing selectivity towards the desired product and to reduce acrolein formation (a detrimental impurity in the subsequent epoxidation of allyl alcohol) the supported iron catalyst was modified using alkali metals. It was found that lithium, sodium, potassium, rubidium and caesium deposition on the catalyst surface increased allyl alcohol yield and reduced the rate of catalyst deactivation. Coincidently, acrolein selectivity decreased by up to 75% following treatment with the alkali salt.Changes in the product distribution were determined to be associated with altering the acid/base properties of the catalyst, as confirmed by isopropanol dehydration/dehydrogenation, ammonia and carbon dioxide temperature programmed desorption. The treatment was also found to influence the physical properties of the catalyst surface. A correlation between acid to basic site concentration and allyl alcohol selectivity was established. A reduction in the former value results in an enhancement in the rate of allyl alcohol formation. A reaction mechanism was developed based on the effect of iron and alkali metals catalysing the conversion of glycerol into allyl alcohol. The proposed catalyst modification technique is a straightforward method, readily applicable at a larger scale due to the simplicity of the alkali inclusion and its striking influence on the reaction selectivity. © 2014. In this paper, we report new insights into the deactivation phenomenon of palladium based catalysts for catalytic combustion of ventilation air methane (VAM). It was found that the primary factor responsible for low temperature catalyst deactivation is the water vapour present in the feed stream. The influence of water vapour on VAM was examined by comparing the properties of fresh catalysts with catalysts following over 1000 h reaction time-on-stream. The techniques applied to characterize the catalysts included TPD, XRD, N 2-isotherm adsorption, H2-chemisorption and XPS analyses. Alternating between dry and water vapour-saturated VAM feed disclosed ca. 50% reversible drop in activity. XPS analysis suggests an absence of a palladium hydroxide phase during the initial 2 h on stream, although prolonged exposure to the reactant leads to the formation of palladium hydroxide, which appears to match the progressive deactivation of the Pd/Al2O3 catalyst. Introduction of VAM dust (a mixture of fine coal, CaCO3 and aluminosilicate particles) causes a variation in catalytic activity originating from coal-dust ignition and the effect of chloride on the surface of the catalyst. In the presence of these inhibiting agents, an average methane conversion of higher than 75% over 1100 h was achieved at reaction temperatures below 600°C. This journal is © the Partner Organisations 2014. A continuous process for the conversion of glycerol to allyl alcohol, where ammonia or organic acids are added to the feed as sacrificial reductants, was investigated. Significant enhancement on the rate of formation and yield of the allyl alcohol is observed with some of the reducing agents examined over an alumina-supported iron catalyst. Optimising the molar ratio of the reductant relative to feed glycerol results in an increase in the yield of allyl alcohol from 9% (in the absence of additives) to 11.3% with ammonia, 15.1% with ammonium hydroxide, 17.8% with oxalic acid and 19.5% with formic acid. Moreover, the addition of other organic acids, which are produced in a typical glycerol conversion experiment, was studied. However, acetic and propanoic acids had little effect on the rate of formation of allyl alcohol. Analysis of the product distribution in the liquid and gas phases when oxalic and formic acids were added suggests a two-step process for the formation of allyl alcohol under the operating conditions of the reaction; the initial step involves the dehydration of glycerol while the second comprises the reduction of the species produced in step one. 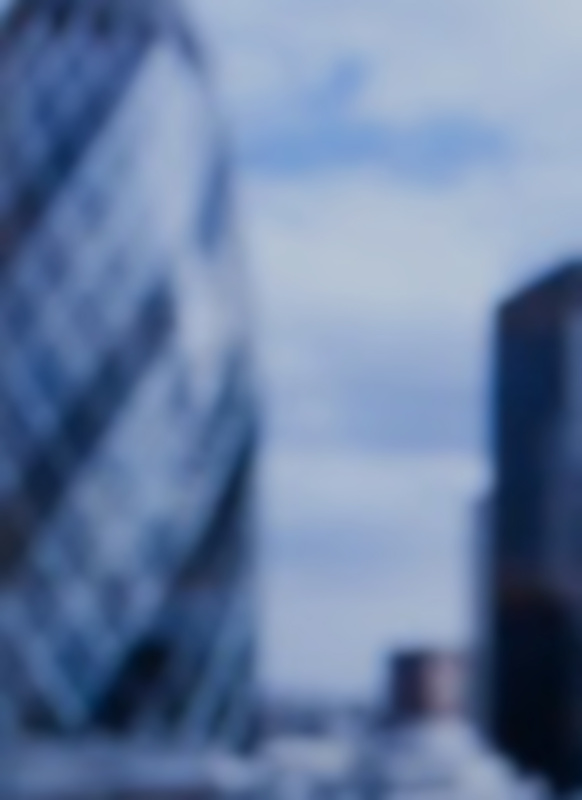 © the Partner Organisations 2014. The adsorption complex of hydrogen chloride on copper-modified ZSM-5 was studied by FTIR and theoretical calculations. The results indicate that the Cl atom of hydrogen chloride is bound to the Cu cations when adsorbed at low pressures (<1 µbar). At higher pressures, HCl adsorbs on the zeolite Brønsted acid sites as well as is hydrogen bonded to the Cu in a larger cluster. Using in situ infrared spectroscopy, we observed a sharp decrease in stretching vibrational frequency of HCl of about 700 cm-1 compared with the H-Cl stretching vibration of gaseous hydrochloric acid. The findings were supported by density functional theory cluster quantum chemical calculations. © 2013 American Chemical Society. The sorption of alkanes in zeolites was investigated using calorimetry, gravimetry, and in situ infrared spectroscopy. At temperatures below 373 K alkanes are found to sorb localized on the strong Brønsted acid sites (bridging Si-OH-Al groups) of H-MFI, H-MOR, and H-FAU via hydrogen bonding of the dipole induced in the alkane and the hydroxyl group. Two n-alkanes, but only one isoalkane, simultaneously interact with the Brønsted acid sites of H-MFI. With the other zeolites only one alkane molecule is sorbed locally per strong Brønsted acid site. About one-third of these sites are accessible to alkanes in H-MOR and about 70% in H-FAU. The heat of sorption decreases in the sequence H-MFI > H-MOR > H-FAU. With increasing size of the hydrocarbon the heat of adsorption increases primarily due to an increase in the dispersion forces. The linear relationships between the enthalpies and the entropies of sorption suggest that the interaction is of similar nature for all hydrocarbons and characteristic for a particular zeolite. The role of Brönsted acid (and basic) sites of molecular sieves is compared for four different acid-base catalyzed reactions, i.e., n-alkane conversion, isomenzation of xylene, reaction of methanol to dimethylether and alkylation of toluene. The coverage at the catalytically active sites and the surface chemistry during the reaction is followed by in situ i.r. spectroscopy using CSTR with i.r. light transparent windows. This allows to directly compare the surface chemistry with the catalytic activities and selectivities. Conventional isotope labelling and steady state isotope transient experiments are used to further support the mechanistic models of the acid-base catalyzed reactions outlined above. © 1994 Kodansha Ltd.
© CURRAN-CONFERENCE. All rights reserved. S/L did not have a considerable impact on the Mg extraction, however, it had significant effect on the Si concentration. Evidence of precipitation of silica at pH 6.1 and high temperature was found. SEM imaging along with EDS analysis provided supporting information on the silica deposits on the surface. The presence of both monomeric and polymeric silica in the filtrated after the dissolution experiment was proved using molybdosilicate standard method. 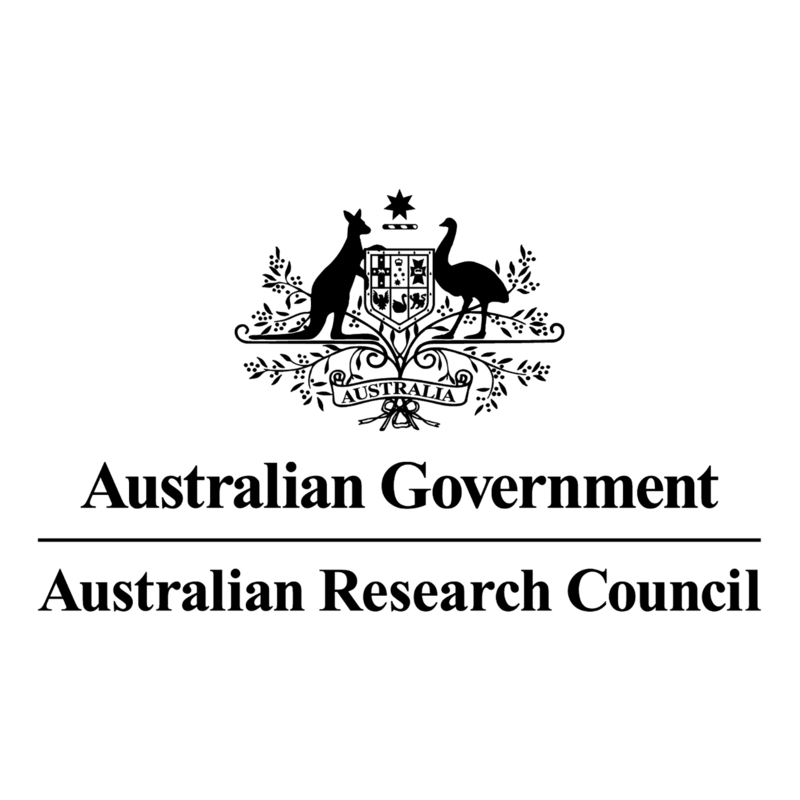 The University of Newcastle has received $1.5m in Australian Research Council (ARC) funding for two of nine national research projects that will focus on developing ground-breaking initiatives to address PFAS contamination in the environment. Michael Stockenhuber discusses ICEC 2016 and Environmental Catalysis.